Advertising Age have an upcoming conference covering Social TV in LA and it is interesting to see ahead of this the number start ups and established businesses already making up the ecosystem to support this arena. This does worry me I have to say, as this is still an arena in early adoption (bowling alley) for consumers and most players out there are not yet fully understanding the customer intent, core need and desire for (or resistance to) commercialization fully. Yet there are a multitude of businesses offering targeting and analytic solutions to brand, marketing departments and customers, which by there very nature will either get in the users’ way if not executed correctly, or take the experience away from their core need, to share thought and interact around a shared experience TV outside of the front room. I agree with Peter Katka from AllThingsD when he says that to many social apps are; “designed around a business problem — how can we get people to stay with our shows longer or hang out on our service? — instead of consumer problems.” This infographic of the industry growing around the need of people to share their experiences whilst watching TV just highlights this clearly. There is a large business here (see update below), and customers are engaging already with 2nd screens whilst consuming TV (or is it the other way round?). There is a better alternative out there than Twitter or Facebook for this type of social interaction (or at least better integrations), and also it can be developed to a much more engaging level than offering additions to the TV shows … but I do hope that the business side does not accelerate too quickly ahead of the core customer experience and interaction. The best digital experiences for users are those which have evolved from being where the customer is and also getting out of there way. 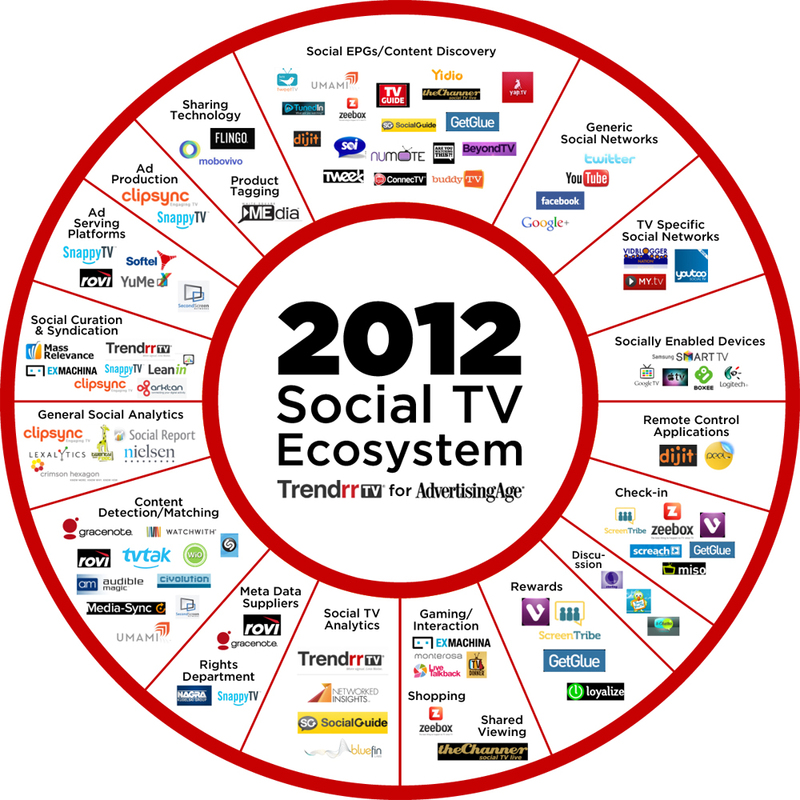 I truly hope that this happens in the social TV space, otherwise a huge opportunity may be lost for some. Also, on a lighter note, I stumbled upon this infographic highlighting the interactions on mobile devices and social interaction whilst … in the cinema. Just shows how blind people are now to the ‘do not’ signs around them when they have an emotional attachment to something … who is the cinema to take that away!? UPDATE: … and the latest on the $ side of this arena from TechCrunch. The market is reported to be worth $151 billion this year, growing to $256 billion by 2017 according to CAGR, so no wonder there are businesses springing up in this arena every day.